Join The Gossip: I am a Delta Z! Today I'm talking Delta Zeta. I pledged DZ in 2001 along with Kathrin of Shop.School.Sleep. To start off I wasn't into the whole sorority thing, but we'd been friends since jr. high and she wanted me to go through recruitment with her so I decided to give it a try. We wanted to join different sororities (to make double the friends) but ended up at the same spot! Our Bid Day was actually THE 9/11. A day I really will never forget. Over the course of my four active years I learned and grew a lot. I stepped out of my comfort zone. I met people I never would have. I was Greek Week Chair. I went to fraternity parties. I made life-long friends. To this day most of my very best friends are a my sisters. I've gone to their weddings, baby showers, baptisms, and countless lunches. I am so lucky to be a DZ! Our badge was designed by Tiffany & Co. Speaking of Delta Zetas, the fabulous Shanna is a DZ! Linking up with her for Random Wednesday. 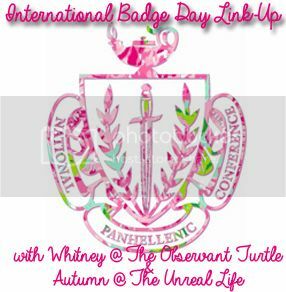 Also linking up with another DZ, Whitney of the Observant Turtle for International Badge Day. AND linking up with Miss Ashlyn for Four Favorites! You guys have the CUTEST mascot, I'm so jealous :) DGS <3 DZs. Love this! I was an ADPI but saw all the national badge stuff floating around everywhere on FB/Twitter/Instragram!! that's awesome! I am obsessed with turtles! I'm actually in ADPi, but people ask me all the time if I'm a DZ because of my weird turtle knickknacks and huge collection haha. I'm so glad Whitney is hosting this link-up; I love hearing what other sorority women love most about their organization! i was in Alpha Sigma Alpha! so fun. i love turtles, like alot! We didn't have DZ at my college but the Greek system was big and everyone in the south did it! I held out for a while but ended up joining Sigma Kappa. It was fun to be a part of. I knew I loved you for a few amazing reasons... but this one takes the cake!! Because I AM A DZ TOO!!! Ahhhh! I pledged in Spring 2007 at Western Carolina University! I was a Alpha Phi and have a similar story to rushing. Oh yay, I love reading about all these greek bloggers! :) So much fun to have that common connection. This is my first time at your blog and I'm loving it so far. The pictures of your puppy in the blog post before this are killing me, she's so cute!! How fun! I wish I had tried to join a sorority! Yaaaaaay!!! This makes my heart sing!!! My sisters are still some of my best friends!!! I hope that Logan and Landry will follow in my footsteps one day!!! The turtle is the cutest mascot ever! My uni didn't have a Greek system. Damn hippies! University of Washington does (where I went after WWU), but I was 23. Haha! Im DZ fall 1996 Californina State University Fresno! It's just a little lamp Girl!! Ugh! I am so sad that I missed this! What a GREAT idea and an awesome way to learn a little more about each other. I am a Phi Mu, and I LOVED every minute of it in college. I definitely have been wanting to get involved with an alumni chapter, and this link-up reminded me why. Regardless of your organization, each sorority had such an impact, and is such a connecting link even in adulthood!